I've never been much of a lipstick wearer. Lip gloss on occasion, but usually only in clear or a very light shade. Chapstick is worn daily. I tried tinted lip balms, but I wasn't really impressed. So I tried lipsticks again. They were too...something. Whether it was the smell, or the taste, or the shade, or the thick caked-on feeling that made my lips feel like they were suffocating, I always found something wrong with them. Then I tried lip stains. Now I'm obsessed. Have you ever tried a lip stain? It gives you the color you want, but it's like you are hardly wearing anything on your lips at all! One of my favorite lip stains is by Tarte. I like their LipSurgence Natural Lip Tint for a number of reasons. 1.) It is infused with peppermint. This is what persuaded me to buy it in the first place! 2.) It glides on SO smooth. Plus, it has a bit of glossiness to it. 3.) I can make my lips a bold color or a can just dab a little on to give them just a hint. 4.) It's clinically proven to increase your lips moisture...true! 6.) It just plain rocks! 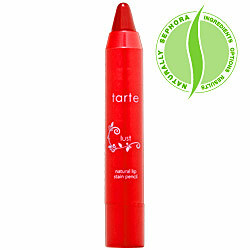 Not to mention that Tarte is an eco-conscious company. The shade I am currently hooked on is Lust (red). It is pretty much my go-to for color and I always have it in my bag. If you aren't into the gloss so much, you can always tone it down with their matte formula, which is also vegan-friendly! 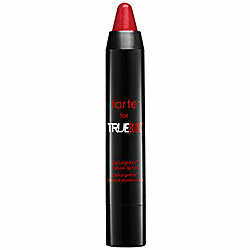 The next stain on my list by Tarte is the limited edition Tarte for True Blood. Another shade of red, but it has an iridescence to it that I cannot wait to try! For a girl who never wore any kind of color on her lips, it's amazing that I want to stain my lips red or any color for that matter! I'm branching out of my comfort zone and getting a great look that is effortless and works for me.